Dawn: (Singing away) On the Twelfth day of Christmas my true Love Food gave to me…. Andrew: Something that will cook slowly whilst we take down the decorations. Dawn: Will it take that long to untangle the lights? Andrew: Several hours after the cat has been at them. Dawn: What do we have left in the Christmas larder? Andrew: A small Christmas pudding, some citrus fruit that has seen better days and the remnants of some pudding rice. Dawn: Do you still have your inventing hat on? Andrew: I’ll fetch it and get to work. If it still fits…my hair needs cutting! Two hours later: Andrew emerges triumphant from the kitchen. Preheat the oven to 150⁰C, gas mark 2. Rinse the rice in a sieve under cold water to remove the starch. Leave to drain. Add the rice, grated zest, sugar, vanilla essence and crumbled pudding to the dish and mix. Pour in the milk and stir so the ingredients are spread evenly. Place into the oven and bake for one and a half to two hours, until the rice pudding has firmed but has a wobble in the middle. Allow to cool for 10 to 15 minutes before serving. Dawn: Gorgeous smell and what an amazing colour! Andrew: An ingenious way to use remaining Christmas ingredients that would simply gather dust in the cupboard. Dawn: Rice Pudding should give you enough energy to get on with removing the decorations now! Andrew: Wasn’t that your job? Dawn: You’re learning to multitask remember! For more in this series of festively inspired food ideas, then follow this blog here and keep up-to-date on Twitter. Facebook and Mumsnet are websites you’ll find us on, too – so keep looking for tasty recipes coming! 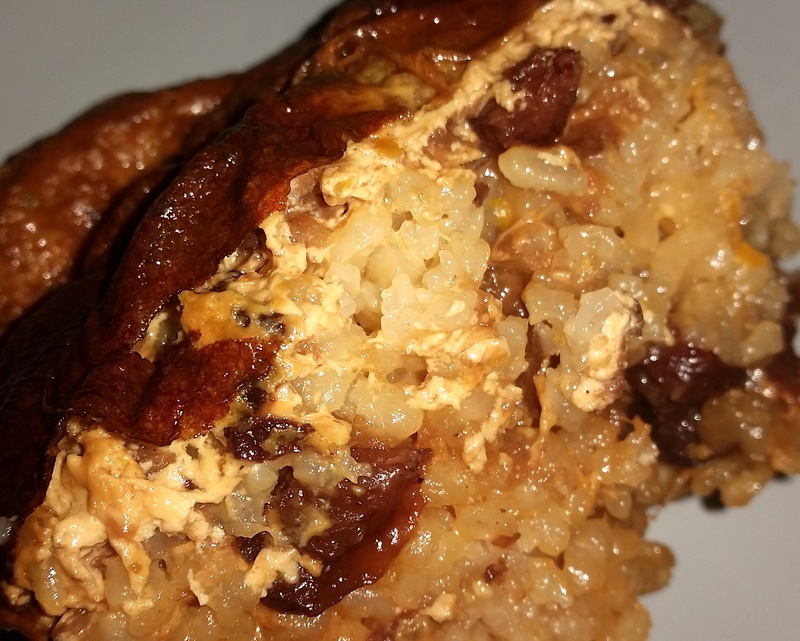 Posted on January 4, 2016 by Love Food UK	• This entry was posted in Christmas, Christmas Leftovers, Home Baking, Just Desserts, Pudding, Seasonal Produce, Special Days and tagged christmas pudding rice pudding recipe, easy to follow rice pudding recipe, leftover xmas pudding recipe, rice pudding recipe witha twist, using up leftover christmas pudding recipe. Bookmark the permalink.